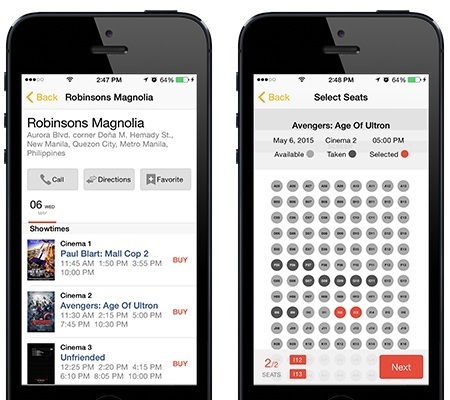 May 11, 2015, Makati City, Philippines - In its continuous endeavor to be up to date with the newest technological trends, ClickTheCity has partnered with Robinsons Movieworld to roll out the latest update to ClickTheCity App. Head's up, moviegoers, this one's especially for you! 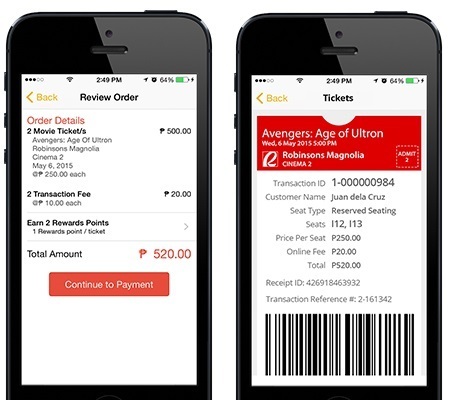 Dedicated to both iOS and Android devices, ClickTheCity App's newest feature is Ticketing Service and it can now be accessed to purchase movie tickets from one of the country's largest cinema operators, Robinsons Movieworld. Users can now begin the cinema experience seamlessly right at the palm of their hands to rid them of the hassles of long lines at ticket booths. 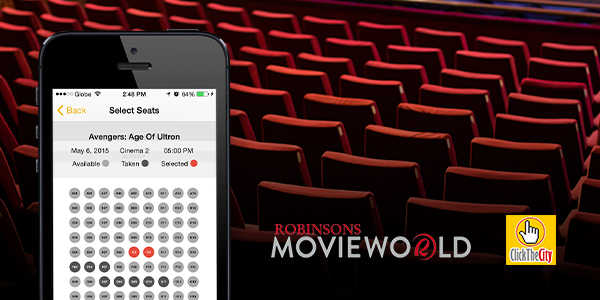 Through ClickTheCity App, users can now book seats at any of the 25 branches and locations of Robinsons Movieworld nationwide. 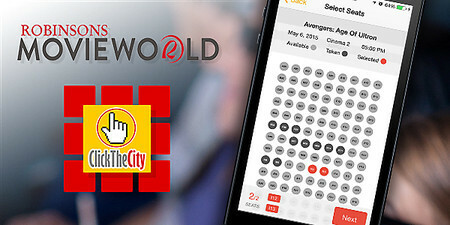 With Ticketing Service on ClickTheCity App, you can now access Robinsons Movieworld Cinema on mobile device to select a movie, screening time, seats, and purchase tickets from wherever you are -- at home, the office, in school, or while on the way to the Robinsons Movieworld cinema nearest you. After purchasing your tickets through the app, all you have to do is to flash the e-ticket on your phone at the cinema entrance, and you're all set to enjoy your movie. Users also receive 1 point for ClickTheCity Rewards per ticket purchased on ClickTheCity App. ClickTheCity App is a locally developed mobile app by Surf Shop, Inc. and has consistently been one of the most popular apps in the App Store (Philippines) since its launch. Through the years, it has provided its app users discounts and perks through Privileges, and the ease and convenience of ordering food for delivery via Mobile Ordering. And now adding to the user experience, the Ticketing Service on ClickTheCity App makes buying movie tickets straight from your phone now appsolutely possible. The new version of the ClickTheCity App can be downloaded for free on iOS devices (iPhone, iPad and iPod touch) and Android phones. To learn more about ClickTheCity App, visit clickthecity.com/mobile/apps/download.php. To learn more about ClickTheCity Rewards, visit clickthecity.com/rewards.